I apologize for the long delay in coming out with Part Two of What is Guru. Between a busy schedule and many re-writes and re-edits, this newsletter seemed to go on forever. By the way if you haven’t read Part One, you can access it here. I also wanted to introduce you, or remind you of a couple of things. 1) Online classes are now going on regularly on Tuesday’s evenings at 8pm EST. Online classes sometimes go on at other times and if you are subscribed to our notifications email, you will be informed of these classes (as I often give online classes more often than Tuesday night). The notifications will also keep you informed of my schedule for my workshops. 3) Snippets of wisdom are available at www.mahatmaswisdom.com and you will shortly receive an email to ask your permission to subscribe to the same. I am doing this because I think you will like and benefit from this. You can opt out at any time. 4) My wife and I are doing tours within India, and retreats in Mayapur. These tours are designed primarily for people new to Krsna consciousness, but anyone is welcome to come because this is a great way for us to spend two weeks together (while also visiting temples and holy places). One week retreats in Mayapur are scheduled for spring and fall, but special retreats can be arranged for groups who want to come at other times. If you are interested in coming, or there is a group of you who want to visit Mayapur and be facilitated on parikramas and other programs, contact me and/or go to our website, www.sacredindiaretreats.org (note that prices listed on our site are not for devotees and will be adjusted for practicing devotees). I wish to begin by looking at the qualification of the siksa and diksa gurus in ISKCON. There may be a tendency to magnify the qualities of one’s guru in an attempt to reconcile in one’s mind the exalted nature of the guru described in sastra with the position of one’s own guru, thinking that if he is a guru he must be on the topmost level of Krsna consciousness. Of course, he may be on that level, but Prabhupada has indicated many times that seeing Krsna face-to-face, being in lila with Krsna, having descended from the spiritual world, being in direct contact with the Supersoul, knowing everything, etc., are not necessary qualifications of a guru because the madhyama bhakta (the devotee in the second stage of bhakti) can also be guru if he faithfully explains and follows the teachings of his spiritual master and the previous acaryas. Prabhupada said that one who is a good follower becomes a good leader. One who repeats the message as he has heard it, without adding or subtracting anything, one who strictly follows the practices of Krsna consciousness and one who dedicates his life to spreading and teaching Krsna consciousness – this person is guru. 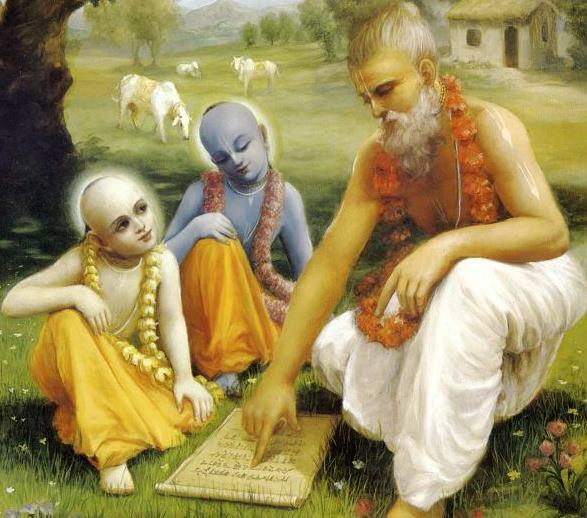 It is crucial to understand these qualifications in order that we don‘t misunderstand the status of gurus in ISKCON; so that we don’t create factions of “my guru is the real guru“; and so that we can acknowledge that following Prabhupāda‘s instructions to us to become guru (either diksa or siksa) is a necessary service which is accessible to sincere and strict devotees. Therefore, all of us, although we may feel we are useless and without any good qualities, can become empowered to guide and save conditioned souls if we sincerely take up the order to be gurus. Whether we take ‘guru’ to mean siksa or diksa guru is not relevant to this discussion. Certainly, I don’t mean to minimize the special position of the diksa guru, but I do want to emphasize that the qualifications for both are similar. As another point of clarification, when I use the term siksa guru in this article, I use it in the context of a fairly formal guru/disciple relationship, not in the sense of a casual relationship in which one sometimes gets advice from another devotee, or occasionally listens to his lectures or reads his writings. In other words, I use it here when there is a relationship in which the devotee is regularly guided in his Krsna consciousness and is committed to following and serving his siksa guru (although the term siksa guru can certainly be used in less formal relationships). In addition, I refer to the diksa guru as “he” because at the time of writing this article, the GBC is still discussing whether or not to allow women to become initiating gurus. This certainly doesn’t mean that a woman cannot be a siksa guru. There are women in ISKCON who have siksa disciples that are aspiring to take initiation from them. There are also many female devotees all over the world who actively give counsel and guidance to other devotees and thus act as siksa gurus. I do not address this topic in this newsletter, but I wanted to clarify this since I only refer to guru in the masculine in this newsletter. Because of improper or incomplete understandings of guru tattva, sometimes unhealthy practices regarding guru/disciple relations take place. I list some examples below. A non-initiated devotee is getting regular guidance from one who is acting as a siksa guru, and the relationship is developing well. Then, the siksa disciple decides to aspire for initiation from another guru, not because there is any problem with the siksa relationship, but because the disciple doesn’t fully understand that his siksa guru could be (or really is) his main guru and thus could be (or should be) his diksa guru. He may not understand this if he thinks a guru is only someone already approved to initiate, or if he thinks that real (or the “best”) gurus must have many disciples, are sannyasis, or in some way are different from his siksa guru. This misunderstanding is not uncommon, and it shows that sometimes a devotee, for reasons mentioned above (or other reasons) may not be able to recognize who his guru really is. In the above scenario, what can happen is that the devotee’s attention will now focus more on his diksa guru and he will take less advantage of the guidance he was getting from his siksa guru. This doesn’t always mean that the devotee will end up being worse off, but sometimes this is the case. In other words, when choosing a diksa guru, one should not make the mistake of lessening one’s connection with one’s siksa guru. One may be aspiring for initiation from a well-known guru in ISKCON and then one meets another devotee who gives him the kind of time and guidance that is not possible for that diksa guru to give. As such, a very close guru/disciple relationship develops, something that the devotee feels is extremely valuable for him. In some cases, this relationship becomes deeper and more beneficial than the relationship he has with his aspiring diksa guru, and taking diksa from his siksa guru (if the siksa guru is willing to give it) would be the natural step forward. But, again, the disciple may not recognize this person as a potential diksa guru or know that it is okay to accept him as his new diksa guru and still maintain a siksa relationship with the diksa guru from whom he was formerly aspiring to take initiation. Let’s look at some reasons one may feel uncomfortable changing one’s choice of diksa guru. Everyone in one area takes diksa from a select number and group of gurus. Since one has seen these devotees as gurus from the early days of their devotional service, they feel it would be improper, disrespectful, socially unacceptable or even offensive to not take initiation from one of them (especially if everyone else is doing this). The devotees in the area where the aspiring disciple lives are predominately disciples of one or two gurus, so he feels he wouldn’t get as much support (or feels he wouldn’t be part of the “family”) if he takes diksa from someone who has few or no disciples in that area. He has had good or longstanding relationships with the prominent diksa gurus in his area, although he may get little personal association with them. He feels it would be offensive to tell the guru he once aspired to take diksa from that he has changed his mind and wishes to now take diksa from someone else. It is not actually offensive and this is not uncommon. If this does happen, the devotee should ask permission from the guru he once aspired for to aspire for diksa from another devotee. He will then receive blessings to pursue a new relationship. And there can be other reasons. Of course, one may take diksa from the prominent local guru, the one he first aspired for, and still have an intimate relationship with his siksa guru, perhaps even more intimate than with his diksa guru. I certainly don’t want to imply that there is anything wrong in choosing a prominent guru, but such decisions should be made in full knowledge of guru tattva, both in terms of philosophy and how the institution of guru is meant to harmoniously function within ISKCON. What other problems result from a misunderstanding of guru tattva? One problem is that devotees only want to hear from their guru. Of course, one should want to hear from their guru. But it is not healthy that disciples are very active in attending the programs of their guru when he is in town, but are rarely seen at other temple programs or functions when he is not present. This is certainly not the way Srila Prabhupāda wanted ISKCON to function. In the Nectar of Devotion (1.1.74), Rupa Gosvami says adau gurv-açrayam, that is, in the beginning of spiritual life one has to take shelter of a guru. The main aspect of taking shelter is inquiring from the guru and following his instructions. The main function of the guru is not in giving initiation; it is in giving guidance. Of course, initiation is important; but as I said in Part One, one should take shelter of a guru and work under his guidance even if one feels they are not yet ready for formal initiation. It is primarily through the instructions of the guru, meaning through the execution of these instructions, that we advance. It is important to note, therefore, that in our disciplic succession many of the guru/disciple relationships listed in the parampara are in actuality siksa relationships. the diksa guru and disciple have little contact or interaction (for geographical or other reasons) and the disciple needs regular guidance from a senior devotee. So, to stress upon the point I have been making, a devotee can take shelter of a siksa guru exactly as one takes shelter of a diksa guru. The prominence of the role either a diksa or siksa guru will play in the life of a disciple will vary according to individual circumstances. Sometimes we see that a siksa guru/disciple relationship develops so naturally that to deny the relationship would be both unfortunate and disrespectful, either on behalf of the disciple, or that of the siksa guru. If one sees and treats the person they take guidance from like a guru, it is good (and proper) to acknowledge that an ongoing siksa relationship exists (or is wanted), that one values it, and that one wants to maintain it.